When TV executives talk about TV Everywhere, they tend to point to HBO Go as the industry’s biggest success story. But the streaming service, which is only available to viewers that subscribe to HBO through their pay TV subscriber, still has a ways to go to catch up with its online competition: New data from Sandvine shows that HBO streams amounted for just 1.24 percent of all residential downstream traffic during peak times in early 2014. Sandvine has been doing Global Internet Phenomena traffic report for years. The company has close insights into the data consumption habits of internet users because its traffic management hardware is used by many of the biggest ISPs around the world. This time around, Sandvine also tried to estimate how much data the average cord cutter is using to replace pay TV with online streaming. The company doesn’t actually know which consumers are paying for TV services and which aren’t, but it noticed that there are users in the top 15th percentile that stream 11 times as much video as the typical consumer. These heavy streamers, whom Sandvine believes to be cord cutters, stream an average of 100 hours of video a month, which brings them a lot closer to ISPs’ data caps than your average user. This article was edited to include Twitch’s new company name, which it changed from Twitch.tv. Uh, you’re comparing apples and oranges: comparing services that are accessible only by streaming, to a service that is accessible by streaming as a secondary (or more properly, quaternary) option. HBO subscribers are likely to watch via 1) live broadcast, 2) DVR recording of live broadcast, or 3) traditional SVOD, before they watch via IP streaming. 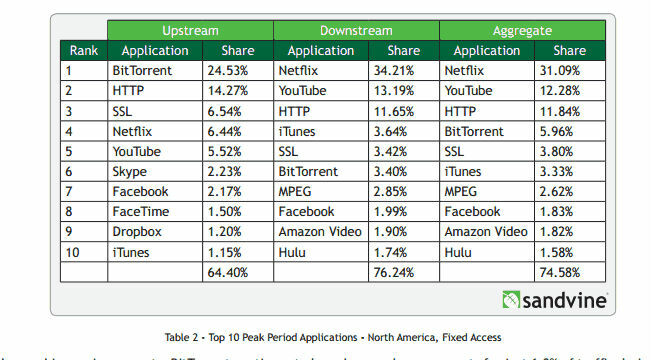 Why is it surprising to anyone if their IP streaming figures are lower — even much lower — than that of IP-only services? Just one more reason to use http://thevpn.guru/how-change-my-netflix-region-vpn-dns-proxy/ and get all Netflix regions including American Netflix instead of only one. HBO seems incapable of grasping that this is a problem. The fact that they have 30 million subscribers and none of them seem particularly interested in their large library of exclusive content is a huge red flag. HBO acts like the fact their subscribers only seem to watch new releases on the linear channel simply shows that is what their customers want. That’s like saying because people used keyboards on phones, customers must want to use keyboards. Until Steve Jobs said, stop using keyboards you stupid people, and made billions. HBO really reminds me of Blackberry before the fall. Everyone knows HBO is sitting on a huge treasure trove of content ripe for profit. Everyone except HBO. So they sell a bunch of it off to Amazon, because when you’re trying to bring in lots of new subscribers, that’s what you do. You dilute the value of your offering. Except, you know, that’s just incredibly stupid. This “pivot” that HBO talks about is not as simple as offering a cable-free option. It requires completely changing how customers perceive HBO as a brand. HBO may be in for a rude awakening. Or someday soon, people will look at what HBO could have been if they just took the massive opportunity in front of them, but instead became something greatly inferior. Is this really so surprising? HBO is predominantly a network with adult-oriented content and Twitch skews very young and very male. There are, I’m sure, plenty of 10 year old boys who aren’t allowed near Game of Thrones (a decidedly mature, grown up show what with all the rapey guys and stabby knights) that are entitled to watch as much Twitch as they want on their laptops in their rooms. Probably while their parents are watching Veep, True Detective, Girls, GOT and every other show on HBO that is not appropriate for kids. I think Twitch’s new company name is actually Twitch Interactive. Who would have though it ? everyone who realizes barriers to entry are important and twitch.tv only has 1 (internet access) while hbo go has 2 (internet access and a TV package that includes an HBO subscription).